We love a good proposal story and this one is definitely one of our favorites! Katie and Dan are self-proclaimed Disney nerds, who love going to see every new Disney movie that comes out! Last year they headed on their annual voyage to Disney where Dan had a special scavenger hunt planned for Katie throughout the park. The scavenger hunt ended with Dan waiting for Katie in front of Cinderella’s Castle on one knee! Katie and Dan’s wedding day featured a little bit of all of their favorite things, because not only do they love Disney, but they are also big fans of all things fall. 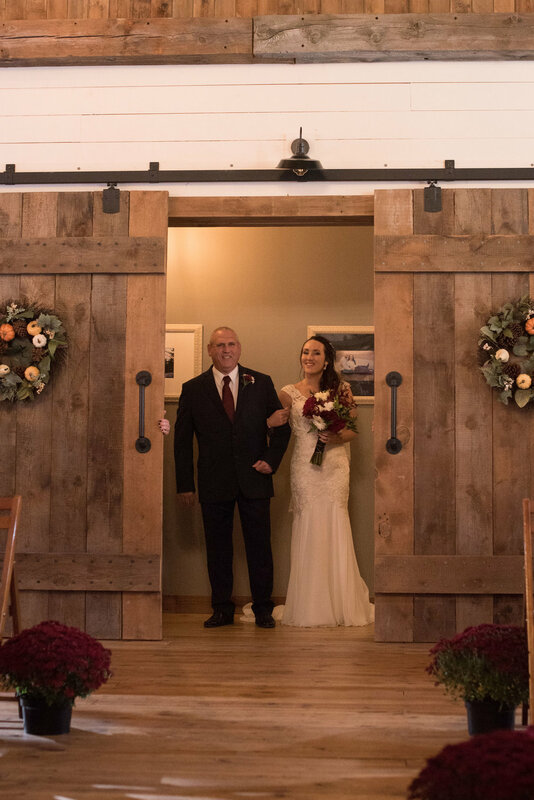 Black Barn Wedding Venue provided the perfect backdrop for their wedding and even through rain drove their outdoor ceremony inside, there was so much love in their intimate ceremony. Wooden farmhouse tables lined with deep navy runners were accented with glass milk jugs with burgundy mums and gords. The bride also highlighted the colors with copper plates and burgundy napkins. Guest dined on delicious food from a Taste of Heaven catering and enjoyed flavorful donuts for dessert, such as apple cider, pumpkin and frosted blueberry. One of our favorite memories from their wedding was how much fun Katie and Dan had on the dance floor towards the end of the night. Pro DJ’s LLC. played some of their favorite Disney songs for the couple and their friends to belt out! Photography by Lindsey Anderson Photography. It was definitely Michigan weather; a chilly, rainy day filled with fall colors and clouds. Our beautiful bride had princess-worthy hair for her wedding day. Cowboy boots and flannels were the perfect accessories for this fall day. Black Barn’s main entrance perfectly framed Katie’s gorgeous wedding dress. Katie and her bridesmaids all looked so beautiful! Hello stunning wedding dress embellishments! Rainy and cold weather drew the ceremony inside, but it could not dampen the amount of love that day. The ladder decor over the head table perfectly framed their ceremony and their sweet first kiss. The most perfect oak tree on Black Barn’s property served as the backdrop for their couple portraits. Katie and Dan fall centerpieces were mixed bud vases and gords with mason jar favors. Navy, copper and burgundy accents added pops of color throughout the room. Lovely toasts for the happy couple! Donuts, donuts, donuts! Frosted blueberry, pumpkin and apple favors were greatly enjoyed by all! This may or may not be my favorite photo from their wedding. Find yourself someone who looks at you with the amount of love that Dan looks at Katie with! Nighttime rain photo magic by the amazing Lindsey Anderson Photography. That’s a wrap, such a wonderful heartfelt evening! Wedding Vendors: Photography: Lindsey Anderson Photography, Wedding Planner: Pineapple Punch Events, Ceremony/Reception Venue: Black Barn Wedding Venue, Caterer: Taste of Heaven, DJ Entertainment: Pro DJ’s LLC., Cake: The Blue Julep. Decor and floral provided by the couple and their families.